The show is over but the fans cry out for what every Elvis Presley fan wants. More! Then, an announcer speaks the words the packed house doesn’t want to hear: “Elvis has left the building.” But what an incredible show lingers in minds and hearts. Elvis on Tour is the Golden Globe-winning Best Documentary chronicle of Presley’s whirlwind 15-cities/15-nights 1972 tour. They are nights to remember, paced here with more than 25 numbers that embrace the rocker Elvis, the gospel Elvis, the ballad Elvis, even the kung-fu Elvis. 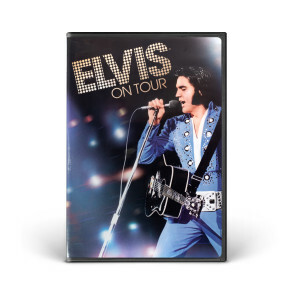 In between tour stops come more moments to treasure – montage sequences (supervised by Martin Scorsese) showcasing Presley’s early career and movies. More!